If you have tiny lashes like mine, finding the right mascara can be quite the task. I've tried many brands and have liked some more then others. So a few months ago, i was at Sephora exchanging a mascara that I'd tried and hated when the sales lady suggested i try a mascara primer. A mascara primer??? What for! I felt as if a mascara primer was just another added step to my make up routine and would lengthen my prep time every morning. I'm a busy mom and don't have time for extra steps in the morning, do you? Well, I'd soon find out how wrong i was! She insisted i try it on one lash and leave the other lash with just mascara. I figured, fine... I'll try it. She handed me the Givenchy Mister Lash Booster. It's basically this sleek tube that twists open and clear gel comes out of the angled tip. You simply apply the gel to the lashes followed by your favorite mascara and voila... gorgeous lashes! I noticed a HUGE difference from one eye to the other and absolutely, positively could NOT walk out of this store without my new found magic wand! I highly recommend it to anyone with tiny lashes as it lengthens, hydrates and separates the lashes! Love at first blink! 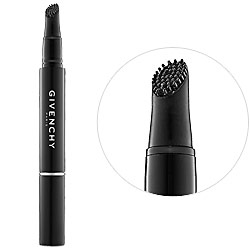 You can find Givenchy Mister Lash Booster at Givenchy Mister Lash Booster . Yes, it's $30 a pop, but your lashes will thank you for it! Before applying mascara, twist the wand until you see a small portion of clear gel. Begin by applying from the part of the lashes that is closest to the eye and work your way up. Make sure you apply to every single lash. Then follow by applying a couple of coats of your favorite mascara. You must do this within the first minute or so after applying the gel. You'll notice how smoothly your mascara goes on! And you are done! The picture below shows precisely how defined, thick and long the lashes look. If you are not sure, do what i did and see for yourself. Next time you go to Sephora, stop by and ask to try it on! Let me know what you think! * A special thank you to my wonderful friend Nicole who took these pictures (kinda hard to do it myself lol). She is truly a 'Jack of all trades'... aka NT! Muah~! **Don't forget to "join this site" at the top right in the blue box if you have not already done so!